I am still amazed at the amount of heel-strikers in the sport of long distance running. In my coaching, the heel-striker will sooner or later come down with a repetitive injury. When a heel-striker makes impact with the ground, their leg is straight which can lead to pain all way up to the lower back. Not only do forefoot-strikers have a natural pad to land on when striking the ground, but the ankle and knee joints allow proper shock absorption to avoid a repetitive injury. At the same time, I have many people who want to run on the forefoot, but are unwilling to spend the time to protect their bodies with the workouts to build up their lower extremities i.e. gastrocnemius, Achilles tendon, feet, etc. The photo of my leg below walking over a hurdle took a lot of work to build up to avoid a repetitive injury. I have clients that range from milers to marathoners, but everyone who comes to see me wants to run faster, without injury, and for a long time. 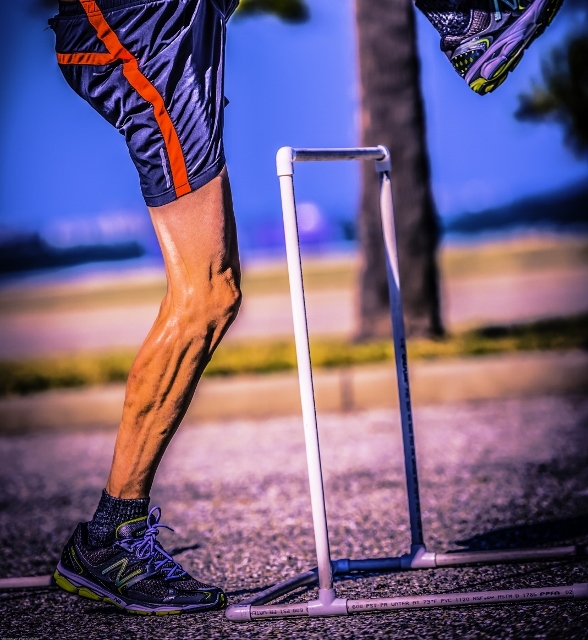 This high aspiration takes awareness of their running technique, strength program, flexibility program, training/running program, recovery, nutrition, mental state, and race strategies. I wish I could say that you can just lace up your shoes and run five times a week for 5 years and not have an injury. People think running is such a “natural” movement, but the more I see people run, the more I think people need help.